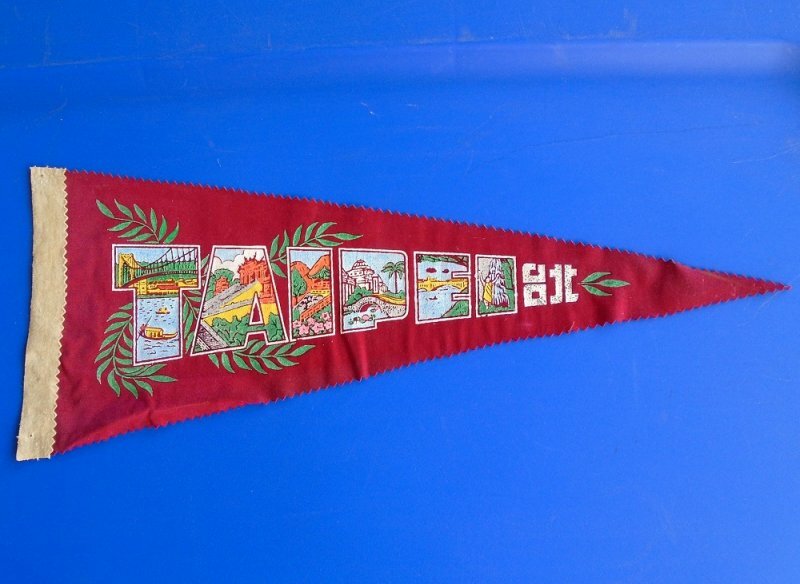 Vintage 1950s to 1960s Taipei Taiwan pennant banner. 17.5 inches long, deep red in color. Estate purchase. I recently purchased a collection of a couple dozen small pennant banners at an estate sale. The informational card stated that they were from the 1950s to 1960s time frame. I can't prove those dates so am taking the sellers word for it. This pennant is from Taipei. It is deep red in color with green leaves. Each letter in the word Taipei highlights an important aspect found in Taipei. It is made of a felt type of material. The vertical side measures 6.75 inches long. The horizontal side measures 17.5 inches long. When held up to the light I can see tiny pin holes at the top and bottom of the long vertical side and also one at the end of the pointed tip on the right. Other than that, my opinion is that it's in very good condition. Delivery will be via USPS First Class Mail Parcel from California. Buyer to pay delivery charges of $4.25.